The book reviewed by John here is now old enough that its fantastical future has become alternative history. 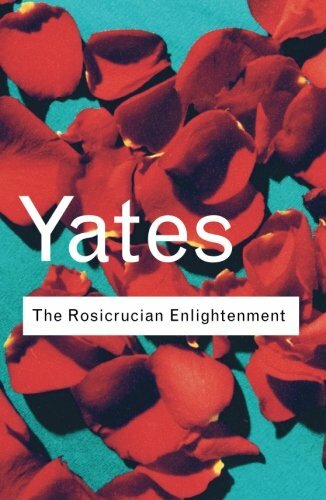 "'Paracelsus is of the opinion,' Dr. Bramble told the theosophists, "that the universe is crowded with powers, spirits, who are not quite immaterial..."
Any novel with sentences like that is likely to have all kinds of remarkable things in it. Certainly "Little, Big" does. In addition to the fairies, there are Upstate New York architectural follies, the return of Frederick Barbarossa, the collapse of the United States, a theory of fiction, and that clockwork perpetual-motion machine in the attic. Perfectly sober social history joins seamlessly with talking animals and a small cottage in the woods that is unaccountably roomy once you get in the door. Like any good fairy story, the book makes the uncanny a present reality, even though the modes in which it is presented are obviously fantastic. Nobody does this better than John Crowley. 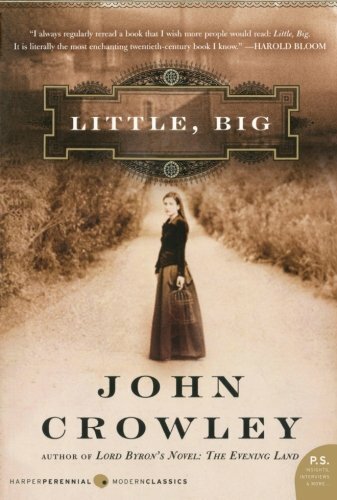 "Little, Big" has a plot, though it is obscured by its entanglement with "The Tale," the thread of fairy history that increasingly impinges on human affairs in the 20th and 21st centuries. The novel is built around the marriage and family history, past and future, of Daily Alice Drinkwater and Smokey Barnable. They wed, apparently sometime in the 1970s, at Edgewood, the Drinkwater family's rambling, indeed protean, old mansion. The house shares the name of its community, which is located somewhere in the wilds of northern New York State. There is an actual Edgewood two hours north of New York City, but this house and neighborhood are clearly on the edge of something more esoteric than a tract of the Catskills. Edgewood was built in the late 19th century by one John Drinkwater, a prominent and ingenious architect specializing in country houses. He married Violet Bramble, the daughter of Reverend Dr. Theodore Bramble, an Anglican priest who theorized about fairies from the pulpit until he lost his rural English parish. Violet, however, really could contact faeries. The Drinkwaters' house (which, among other things, was designed to present different historical styles, depending on the angle of view) soon became the center of a woodland community of genteel mystics. We get a good measure of fairy lore, and even more lore about the study of fairies. Fairy pictures are much in evidence, as well as speculation about whether fairies have any native form, or any inherent will, or are just occasions for projections of the human mind. Some of the researchers devise complicated descriptions of the fairy realm: Dr. Bramble, for instance, memorably describes the Otherworld as "infundibular." By that he meant, to the slight extent he was willing to be understood, that it consists of worlds nested within worlds; the more deeply a world is nested, the larger it is on the inside. Crowley does not neglect to have a character observe that this is pretty much the way that fiction relates to the common world. "They had been members with John of the Theosophical Society; they were both in love with Violet. Like John's, their lives were full of quite drama, full of vague yet thrilling signs that life was not as the common run supposed it to be; they were among those (it surprised Violet how many they were, and how many gravitated toward Edgewood) who watch life as though it were a great drab curtain which they are sure is always about to rise on some terrific and exquisite spectacle, and though it never did quite rise, they were patient, and noted excitedly every small movement of it as the actors took their places, strained to hear the unimaginable setting being lifted." This sense of expectancy is, perhaps, closely related to what C.S. Lewis called "Joy," and to what the Welsh call the "hiraeth." Something else that is quite real is that it often eventuates in religious conversion. However, in this book Crowley displays the same dismissive distaste for Christianity that marks his later ones. (We are told that the Church has virtually ended for lack of a Second Coming). What does happen is that the teacup religion of 1900 becomes the basis of a new culture. The Mormons are not mentioned in the text, but like them, the increasingly immiserated descendants of the genteel theosophists gradually become a people. At the end of the Tale, also like the Mormons, they set out for a Promised Land. The process of immiseration is particularly interesting, because we have here yet another instance of a novel set in the future that has become alternative history. To preview the early 21st century, the author simply extended for a generation the economic doldrums and political confusion of the time the book was written. By the time that Auberon, the son of Smokey and Alice, goes to the City to seek his fortune, the City has changed utterly from the day his father left it, because it had ceased to change. We are told that the waves of fashion had become a mere trickle, and the tides of enterprise had become a still bog. New York really was not designed for stasis, and neither was the country as a whole. Nothing works as it once did, and every attempted remedy miscarries. The real power in the country is exercised, informally, by a group called the Noisy Bridge Rod and Gun Club. They often consult with the greatest magus of the age, who inevitably turns out to be another Drinkwater cousin. They do not take seriously her warnings about the persistence and resurgence of the Holy Roman Empire. We are not told in any detail about the accelerating unraveling of the wider world, but it seems reasonable that exurbanites might turn into peasants under such conditions. Well, almost reasonable. "How does a tale end that was only a promise of no ending? In the same way as a difference comes to inhabit a world that is otherwise the same in all respects; in the same way in which a picture that shows a complex urn alters, as you stare at it, to two faces contemplating each other...He fulfilled the promise, that it wouldn't end: and that was the end. That's all." What relevance this may have to Crowley's continuing Aegypt series remains to be seen. "Little, Big" has a wonderful autumnal feel to it. It is infused with a relaxed, whimsical, twilight state of mind that is conducive to entertaining fairies, at least as a hypothesis. This is the kind of book one can't recommend highly enough to the people who like this sort of thing. They are surprisingly numerous, and they don't all live in the neighborhood of Edgewood. The reviewer would be gratified if you would also consider buying this book. John major emphasis was millennialism. I think he had a minor emphasis in the occult as well, insofar as these two things have a tendency to overlap. His book reviews of occult fiction are especially good. This book is the third of the projected four in John Crowley’s major novelistic treatment of gnosticism and hermeticism. As in the two prior books, “Aegypt” (1987) and “Love & Sleep” (1994), “Daemonomania” is held together, rather loosely, through the character of Pierce Moffet, a young historian living on a publisher’s advance. We meet him in the first book as he settles down in the Upstate New York town of Blackbury Jambs in the 1970s, to write a hermetic interpretation of history. (Inevitably, the working title of the manuscript is “Aegypt.”) Through Moffet’s friends and lovers, we are introduced to a local mystery that, in this third volume, builds to a climax of universal significance. His researches link this mystery to a parallel story that encompasses Dr. John Dee (Elizabeth I’s favorite magus), Giordano Bruno and the uncanny Prague of Emperor Rudolph von Habsburg. The series makes use of the latest research about werewolves and witchhunts, ancient and modern. Readers interested in the academic study of the occult will love all this. The author is generous with bibliographical information. A recurring theme is that “there is more than one history of the world.” Each new age not only looks forward to a different future but remembers a different past. The “Aegypt” of hermetic wisdom that was known to the scholars of the Renaissance had only a few points of contact with the “Egypt” of modern archeology. The difference is not just a matter of more and better information, but of distinct conceptual universes. What seems to us to be a continuous history of ideas is really divided into “dispensations” in which people have quite different conceptions about what is reasonable and possible. This way of looking at history is familiar to us from, for instance, Thomas Kuhn’s notion of successive “scientific revolutions,” and from Michel Foucault’s proposal that different “epistemes” governed different regions of the past. At least for the purposes of this series, however, the author goes beyond intellectual history to suggest that not just the sense of the possible, but the possible itself may change as one age fades into another. In the 20th century part of the series, the myth takes the form of the rescue of a little girl with the ability to see dead people. (At the risk of stating the obvious, this rescue recapitulates the gnostic myth of the rescue of the Divine Sophia from the world of matter.) The people the little girl needs to be rescued from belong to a Christian cult called “The Powerhouse,” which specializes in therapy through exorcism. In a way, this is an argument from process theology: Christianity may have been true in the past, or at least effective. However, it will not be so in the coming age. Indeed it does, so much so that it is not obvious that anything remains to be said after this third volume. The world has already ended twice, after all. Nonetheless, the publisher assures me that a fourth book is planned. 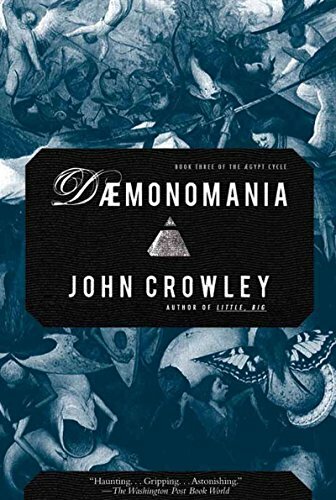 Some hints in “Daemonomania” suggest that a further book might deal with the near future, as did Crowley’s novella, “Beasts” (1976). Despite these criticisms, Crowley’s blend of magic, blasphemy and postmodernism works very well as fiction. He can create uncanny affect better than anyone since Arthur Machen. Unlike Machen, he also has the sense to confine most manifestations of the supernatural to dreams and coincidences. The hermetic twilight has rarely been made to seem so plausible. Will the series persuade many people to its view of the world? Probably not, but that may be the measure of its success. The merit of these books is that they express the indeterminacy of a time of transition. The nature of twilight, however, is to resolve into either day or night. This review originally appeared in the March 2001 issue of First Things.